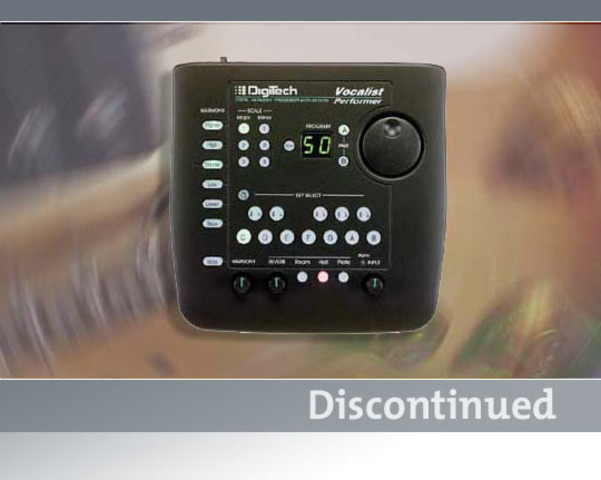 DigiTech Performer, the MIDI free Vocal Harmony processor with Reverb. Designed for acoustic and electric guitarists, piano players and solo singers, Performer can be "hands free" and does not need to be controlled by MIDI. No editing screens and spending hours learning a user interface. Spend your time on music not music technology. Imagine instant harmony at your finger tips! Create hundreds of harmony styles from 50 different factory presets, each with 6 variations. Simply select the key of the song from the front panel keyboard and sing! Choose harmonies above or below your lead vocal. There's even excellent reverb included with switchable room types. Just plug your microphone directly into Performer, run the output to an amp and go for it! The optional DigiTech FS-300 footswitch lets you bypass harmony, switch from the A&B sections, lets you turn the reverb on and off and mutes individual voices as you play or sing. For you home studio enthusiasts, Performer also has a line input so you can create perfect natural sounding harmonies for your demos. Create harmony "live" in real time or use Performer to add up to two more vocals to a previously recorded track using the line input. No more 4 track quality loss that comes from bouncing down the music to one track in order to free up fresh tracks for vocals. It's like adding two more tracks to your deck!